After my awful pun title for last week’s post on Apple Jacks , I think I may have surpassed myself this week. Sorry about that – couldn’t resist it again am afraid. Anyhow apology out the way and on to the matter in hand. I had heard many good things about them online including a big thumbs up from the always excellent Cardiff in a tea cup blog. Who knew tea had such cool names, Iron Goddess of Mercy and Meghalaya Autumn – Laryrsiew, the Awakening (sounds like a fantasy novel or video game that last one) for instance. Whilst I am still pretty much an ignoramus on the subject, I am slowly learning and broadening my horizons past my staple of Twinnings breakfast tea (white, no sugar if you’re making). 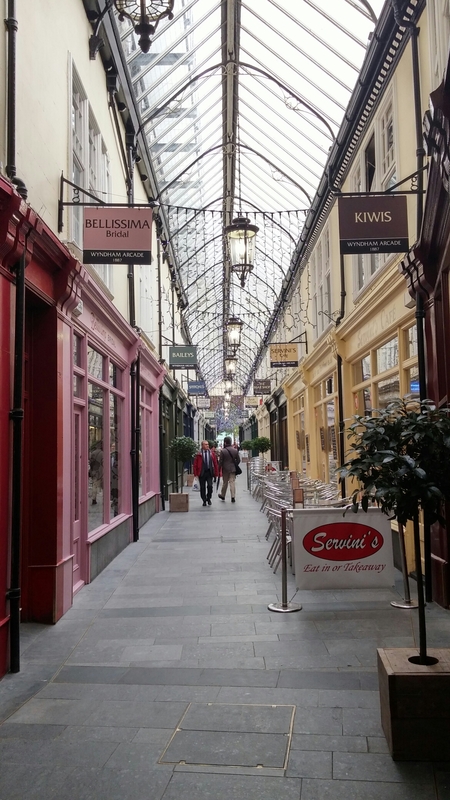 Having started in the Penylan suburb of Cardiff, Waterloo Tea now has outposts in the nearby seaside town of Penarth and most recently in the city centre in the rather beautiful Wyndam Arcade (conveniently close to my office). As they have what seemed a pretty enticing new lunch time menu, offering more than just tea and cakes (cakes look really rather good mind), this was a natural choice for lunch with J. It is a nice looking place with a very unfussy decor. A mix of tables, chairs and leather sofas make it somewhere I could happy have lunch or tea and a cake before moulding myself into a sofa with a good book. 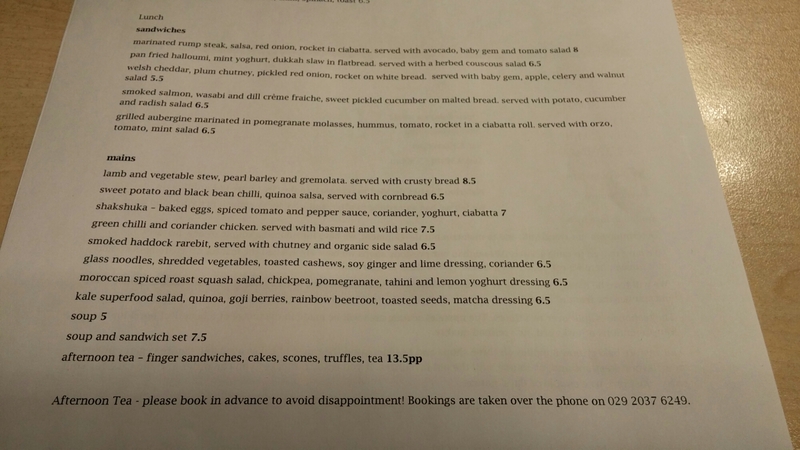 The new lunch menu is a mix of yummy sounding sandwiches and more substantial dishes. Stuff here of interest to both meat eaters and veggies. I went for the Shakshuka (£7), pretty much because I like saying it (and have the urge to say “bless you” to anyone who says the word). I have only come across it recently (where, Shakshuka – bless you, have you been all my life?). J (off her wierdo diet having run her first marathon – I did proffer the view that the Snowdon Marathon was not the wisest choice for her first marathon, but she finished it so what do I know and kudos to her for doing something I could never do) went for the lamb and vegetable stew. 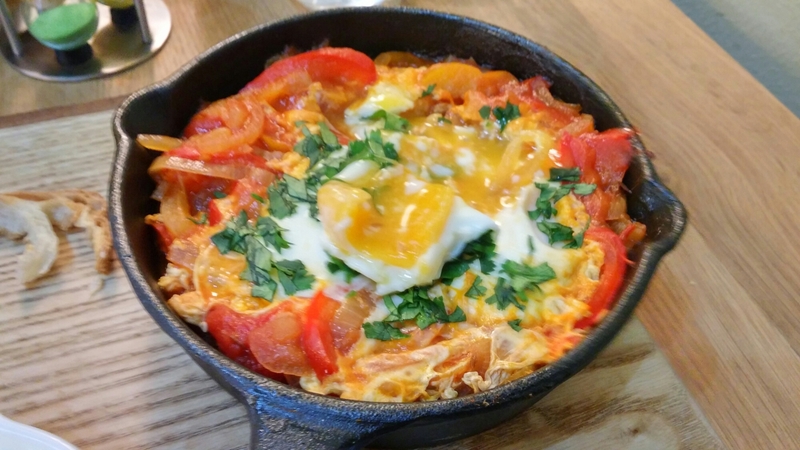 For those who don’t know what it is, shakshuka (I was enlightened – prior to this meal – as to what it was by way of a Twitter exchange with that guru of all things veggie, the Hungry City Hippy ) is a one skillet dish of baked eggs in a spiced tomato and pepper laden sauce. 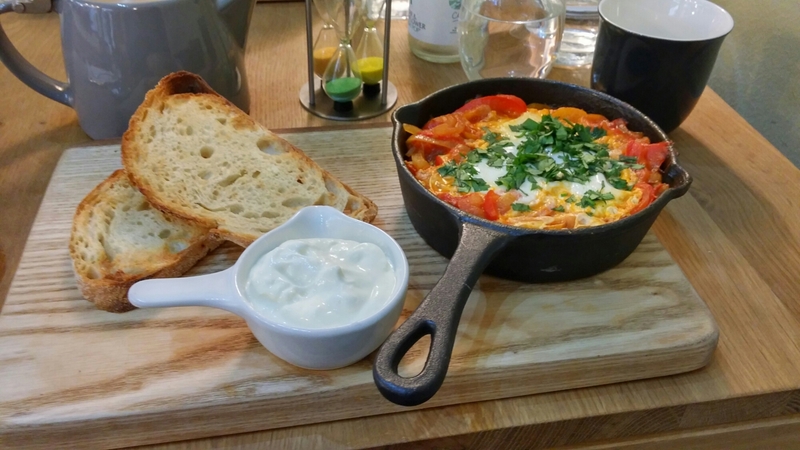 It is usually a breakfast or brunch dish but to me is more than suited also to lunch time.This was my first Shakshuka and boy was it a really nice bit of comfort food. Perfect for the miserable weather we have been having of late. Pretty as a picture, the dish had lovely runny (once pierced) eggs on top of it into which I could dunk the really good accompanying toasted ciabatta bread. Underneath the eggs was a nice spicy (but not flamingly hot) pepper and onion stew. It came with some cooling yoghurt in a side dish which went really well with the spicy pepper and onion sauce that formed the base of this dish, as did the liberally scattered chopped coriander atop the dish. It was a very decent sized portion for the price, which left me nicely sated. A deeply satisfying dish that I am definitely going to try and reproduce at home and, to me, very good value for its £7 price tag. 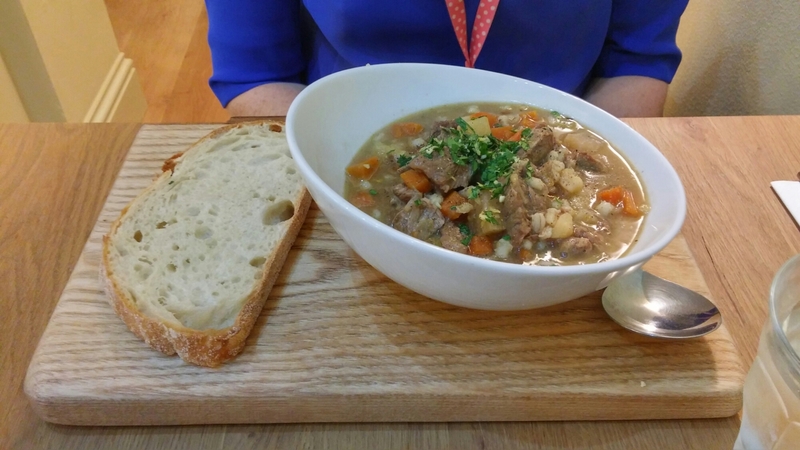 J’s lamb stew (£8.50), which I didn’t get the slightest look in in terms of trying it, looked and smelt really good. Decent chunks of what J described as meltingly tender lamb, plentiful veggies and pearl barley, in a very flavoursome broth. This was complimented by a punchy gremolata (finely chopped and mixed lemon zest, garlic and parsley) and some nice bread. Again this was a generous portion. 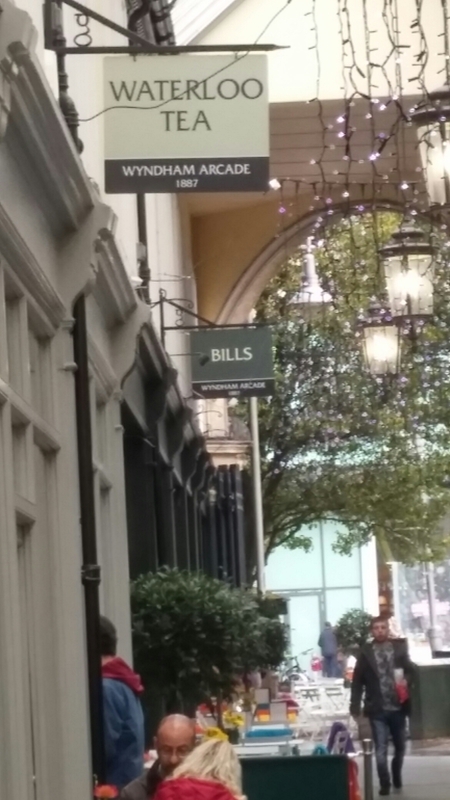 On the drinks front, as it is a tea house it would have been churlish not to have some tea – so I did (J didn’t – I despaired, she rolled her eyes). Not being very up on tea and food combinations, I asked our waiter what he would recommend with the Shakshuka. He provided several suggestions and I settled on an Oolong called Spring Season (£3.50). This came in a charming pot which arrived with a multi-coloured sand timer. J saw my face light up when the timer arrived and she said you love that don’t you – I did, very much. Boys and toys. 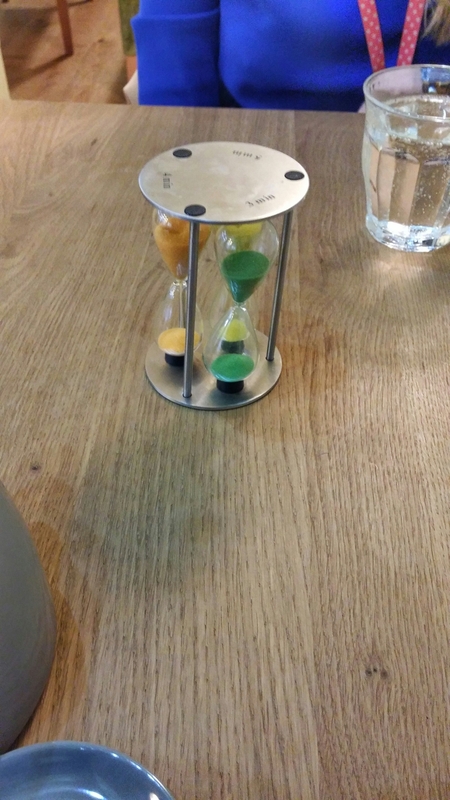 I was advised by the waiter to leave it to infuse for at least 3 minutes (he pointed out the correct colour sand for this in the timer), but said some people like to leave it a bit longer (and so he also showed me the 4 minute coloured sand). I left it for 3 minutes, but found it a bit weak so left it for another minute or so. Can’t be entirely sure as to exact timings, as about half way through I couldn’t resist played with the sand for a bit. The longer infusion time was much more to my taste and the resulting brew was quite floral (jasmine I would say) on the nose, with that and a nice light earthiness coming through in terms of flavour. No idea if that is what it is suppose to taste like, but I found it very refreshing and an excellent match for the Shakshuka. 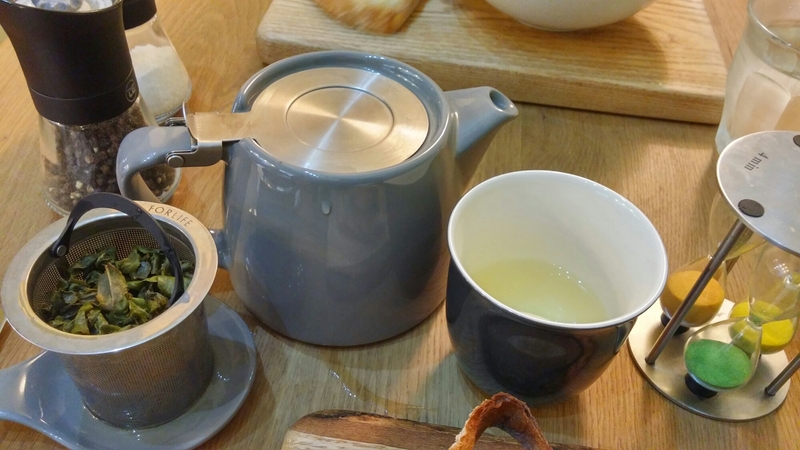 I really enjoyed, what was my first visit to a proper tea house in the UK (had a great time in one in Malaysia a few years back). Must say I find the varieties of teas available to be fascinating and the different aromas and tastes from different teas (and the same types of teas from different countries, estates and even altitudes) reminds me of my first love, drinks wise, wine. Lot of similarities, in my opinion, between the two. 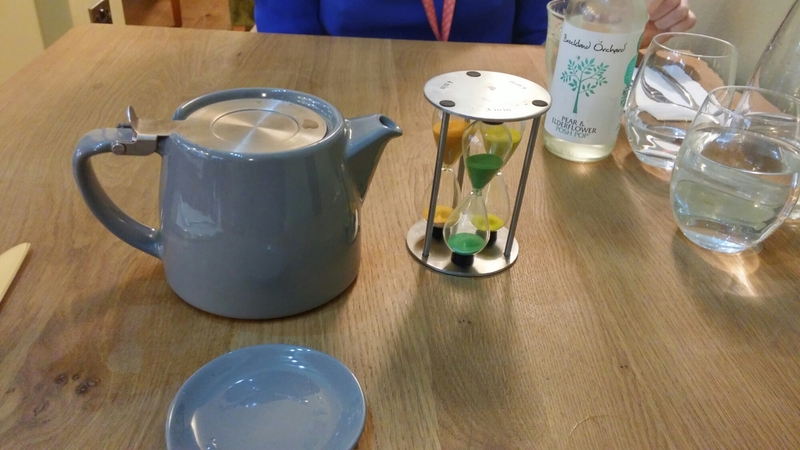 Waterloo Tea’s Wyndam Arcade outpost is a great place (as are their other teahouses in Penylan and Penarth) to explore the world of tea, with the added bonus of rather good food being on offer. Would I go back? Definitely, it has further peeked my interest in the world of tea. Food to go with the teas is top notch as well. 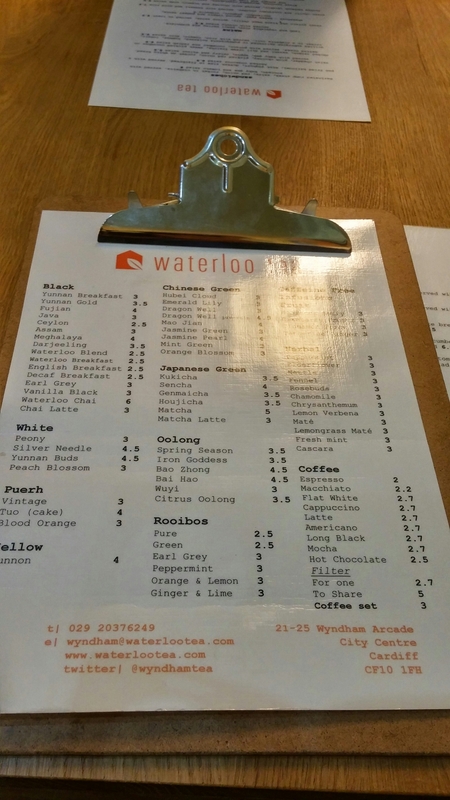 This entry was posted on Nov 30, 2014 by solicitingflavours in Cardiff, Drink, Food, Food and wine products, lunch, lunchtime, Oolong, Restaurant Review, Tea, Tea house, Wales, Waterloo tea.